A Unique Model Illustrating Blood Flow. It’s the perfect way to acquaint students with the way blood flows through a human body. Simulating a corrosion preparation, only the Vascular system is visible. 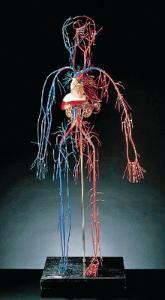 The arterial system is shown in red, the venous system in blue. The 3/4 life-size model is constructed of hardened plastic-coated metal wire, is supported by a metal rod. The model is mounted on a metal base and includes a key identifying 240 structures.